Al-Qaeda in the Indian Subcontinent (Arabic: جماعة قاعدة الجهاد في شبه القارة الهندية‎, translit. Jamā‘at Qā‘idat al-Jihād fī Shibh al-Qārrah al-Hindīyah, lit. 'Group of the Base of Jihad in the Indian Subcontinent') usually abbreviated as AQIS, is an Islamist militant organization which aims to fight the governments of Pakistan, India, Myanmar and Bangladesh in order to establish an Islamic state. The militant group has also stated its intentions to attack American targets in the Indian Subcontinent. This group is listed as a terrorist organization by the United Nations, United States, Canada and India. Before coming together under AQIS, there were various jihadist factions operating in Pakistan, Bangladesh, and Afghanistan. One of these factions operated in Karachi, Pakistan, and were responsible for numerous attacks in the city. On 11 December 2014, AQIS issued a report detailing these attacks. The attacks targeted local police, a professor, and a blogger. On 3 September 2014, Ayman al-Zawahiri, leader of al-Qaeda, announced the establishment of a new branch in the Indian subcontinent in a 55-minute video posted online. During the announcement, Zawahiri stated that it had taken two years to gather various jihadist factions into the new group, and introduced Asim Umar, a former commander in the Tehrik-i-Taliban Pakistan, as its Emir. The announcement also introduced the group's spokesman, Usama Mahmoud, who praised militant commanders like Amjad Farooqi, Ilyas Kashmiri and Hassan Ghul. Farooqi was killed by Pakistani security forces. Kashmiri and Ghul were killed by US drone strikes in Pakistan. In 2014, Pakistan Navy lieutenant Zeeshan Rafiq and former lieutenant Owais Jakhrani joined Asim Umar's al-Qaeda's faction with plans to attack US Navy ships in the Arabian Sea. They intended to hijack the PNS Zulfiqar, a frigate carrying C-802 cruise missiles and a tactical nuclear warhead, and use the ship's armaments to fire on nearby US and NATO vessels. On September 6, 2014, the AQIS militants, including Rafiq and Jakhrani, failed in their attempt to seize the PNS Zulfiqar. Pakistani forces stationed at the Karachi docks saw through the militants' disguises as they tried to board the ship, leading to a firefight that left eleven attackers dead. In October, a Kashmiri militant group calling itself "Ansar ut-Tawhid wal Jihad in Kashmir" published a video expressing support for Al Qaeda in the Indian Subcontinent. The group offered to provide shelter to foreign fighters within AQIS as well as fight alongside it. On 19 October 2014, a 117-page English-language magazine called Resurgence was released online. It was produced by the Subcontinent branch of Al Qaeda's As-Sahab media production house, and the articles focused on waging jihad in the Indian Subcontinent. Al Qaeda in the Indian Subcontinent has released multiple statements, mainly via the Twitter account of Usama Mahmoud, the group's spokesperson. On 14 October 2014, Mahmoud confirmed that AQIS senior leader Imran Ali Siddiqi was killed in a US drone strike. He also spoke about the US-led coalition in Iraq and Syria. Siddiqi was a member of the group's Shura council. On 4 November 2014, Mahmoud released a series of tweets that condemned what he said as the "Infidel System." He also prayed for god to support militants in Chechnya, Dagestan, and Yemen, as well as Iraq and Syria. The following day, Mahmoud released a statement giving condolences to the killing of Somali al-Qaeda leader Ahmed Abdi Godane. He directed a statement to Somali fighters which said that the US must be fought. On 20 December 2014, Usama Mahmoud, spokesman for AQIS, condemned an attack on a school in Peshawar, Pakistan, which was carried out by the Pakistani Taliban. He said that the attack was un-Islamic and that "the massacre of innocent children makes our hearts burst." ^ Sanger, David E.; Mazzetti, Mark (June 30, 2010). "New Estimate of Strength of Al Qaeda Is Offered". The New York Times. Archived from the original on 2017-08-04. Retrieved 2017-02-24. ^ a b c "Al Qaeda in the Indian Subcontinent incorporates regional jihadist groups". Long War Journal. 5 September 2014. Archived from the original on 2014-12-20. Retrieved 22 December 2014. ^ Our Reporter (28 March 2004). "Top Al Qaeda leader hurt, hiding in Wana: ISPR". Dawn News, 28 March 2004. Archived from the original on 2 July 2013. Retrieved 20 March 2019. ^ Khan, Ismail (26 March 2004). "Army winding up operation: Corps Commander". Dawn, 26 March 2004. Archived from the original on 2 July 2013. Retrieved 20 March 2019. ^ Raza, Syed Irfan (5 May 2005). "Al Qaeda's number three Faraj Al Libbi arrested". Dawn News area studies archives, 2005. Archived from the original on 29 March 2013. Retrieved 20 March 2019. ^ Sophia Saifi, Ben Brumfield and Susan Candiotti (6 December 2014). "Pakistan kills al Qaeda leader on FBI most wanted list". CNN. Retrieved 20 March 2019. ^ DelhiDecember 27, Ankit Kumar New; December 27, 2017UPDATED:; Ist, 2017 15:33. "In new video, Al-Qaeda says attacking Indian cities must to weaken security forces' grip on Kashmir". India Today. Archived from the original on 2019-01-16. Retrieved 2019-01-15. ^ "ALARMING: Al-Qaeda puts India on hit list, calls for fresh attacks". www.timesnownews.com. Archived from the original on 2019-01-16. Retrieved 2019-01-15. ^ "Arrested Al Qaeda terrorists planned attacks on Kolkata schools". theweek.in. Archived from the original on 2019-01-16. Retrieved 2019-01-15. ^ "Al Qaeda affiliate says killed gay activist in Bangladesh". April 26, 2016. Archived from the original on 2019-01-17. Retrieved 2019-01-16 – via www.reuters.com. ^ "Ansar al-Islam claims Bangladesh student's killing". www.aljazeera.com. Archived from the original on 2019-01-17. Retrieved 2019-01-16. ^ a b "Al Qaeda's 'India' wing an old plan". India Today. 14 September 2014. Archived from the original on 2014-09-17. Retrieved 15 September 2014. ^ "Al Qaeda finds base in India, Modi is on its radar". The Sunday Guardian. March 29, 2014. Archived from the original on 2014-06-06. Retrieved June 5, 2014. ^ "Indian states on alert after al Qaeda announces local wing". Reuters. 4 September 2014. Archived from the original on 2014-09-06. Retrieved 5 September 2014. ^ "Al-Qaeda opens branch in Indian subcontinent". AFP. 4 September 2014. Retrieved 4 September 2014. ^ "AQIS Reports on Attacks in Karachi from Nov. 2013 - Oct. 2014, Targets Police, a Blogger, and a Professor". SITE Institute. 11 December 2014. Archived from the original on 2014-12-23. Retrieved 2014-12-23. ^ BARRY, By ELLEN (4 September 2014). "4 Young Men Head for Iraq, Citing Fight for Islam, and India Wonders if More Will Follow". NYTimes.com. Archived from the original on 2014-09-07. Retrieved 7 September 2014. ^ a b c Mirsab, A. "Condemnation continues to pour from all corners against Al-Qaeda establishment in South Asia". TwoCircle.net. Indian Relief and Muslim Charities. Retrieved 22 January 2017. ^ a b c Coll, Steve (2018). Directorate S: The C.I.A. and America's Secret Wars in Afghanistan and Pakistan. New York: Penguin Press. pp. 653–660. ISBN 9781594204586. ^ "Al Qaeda South Asia commander held in Karachi". The Asian Age. 13 December 2014. Archived from the original on 2014-12-16. Retrieved 16 December 2014. ^ "US killed AQIS deputy emir, shura member in January drone strikes". Long War Journal. 12 April 2015. Archived from the original on 2015-04-14. Retrieved 13 April 2015. ^ "Al Qaeda will fail to recruit India's Muslims, Prime Minister says". CNN. 22 September 2014. Archived from the original on 2018-03-25. Retrieved 2018-03-25. ^ ""Ansar ut-Tawhid wal-Jihad in Kashmir" Expresses Support for AQIS". SITE Institute. 10 October 2014. Archived from the original on 2014-12-23. Retrieved 2014-12-22. ^ a b "AQIS Spokesman Condemns "Infidel System," Prays for Fighters in Chechnya, Dagestan, and Yemen". SITE Institute. 4 November 2014. Archived from the original on 2014-12-23. Retrieved 2014-12-22. 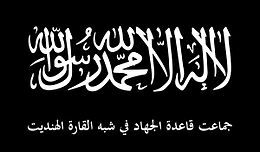 ^ a b "AQIS Gives Eulogy for Former Shabaab Leader, Reminds that US Must be Fought". SITE Institute. 5 November 2014. Archived from the original on 2014-12-23. Retrieved 2014-12-22. ^ "Analysis: Al Qaeda's 'Resurgence' focuses on Indian Subcontinent". The Long War Journal. 23 October 2014. Archived from the original on 2015-04-22. Retrieved 8 April 2015. ^ "Al Qaeda in the Indian Subcontinent claims 2 attacks in Pakistan". The Long War Journal. 13 September 2014. Archived from the original on 2014-09-15. Retrieved 2014-09-15. ^ "AQIS Explains Motivation for Targeting US Navy in Karachi, Considers America its Primary Target". SITE Institute. 17 September 2014. Archived from the original on 2014-12-23. Retrieved 2014-12-23. ^ "AQIS Clarifies Targets of Karachi Naval Yard Attack as US, Indian Navies". SITE Institute. 30 September 2014. Archived from the original on 2014-12-23. Retrieved 2014-12-23. ^ "AQIS Spokesman Confirms Death of Official in Drone Strike, Reiterates Call to Target America". SITE Institute. 14 October 2014. Archived from the original on 2014-12-23. Retrieved 2014-12-23. ^ "AQIS Leader Eulogizes Shura Council Member Killed in US Drone Strike". SITE Institute. 10 November 2014. Archived from the original on 2014-12-23. Retrieved 2014-12-23. ^ "AQIS Spokesman Announces Death of Two Officials, One of Whom Owned House Where Khalid Sheikh Mohammed was Captured". SITE Institute. 20 November 2014. Archived from the original on 2014-12-23. Retrieved 2014-12-23. ^ "AQIS Gives Eulogy for Two Slain Officials, Urges Doctors and Pakistan Military Officers to Follow Their Example". SITE Institute. 24 November 2014. Archived from the original on 2014-12-23. Retrieved 2014-12-23. ^ "AQIS Provides Picture of Two Officials Killed in US Raid in November 2014". SITE Institute. 5 December 2014. Archived from the original on 2014-12-23. Retrieved 2014-12-23. ^ "Al Qaeda condemns Pakistani Taliban's attack on Peshawar school". The Long War Journal. 20 December 2014. Archived from the original on 2014-12-21. Retrieved 2014-12-23. ^ "Al Qaeda in the Indian Subcontinent claims 2 attacks in Pakistan". Long War Journal. 13 September 2014. Archived from the original on 2014-09-15. Retrieved 15 September 2014. ^ "First claim by al-Qaeda subcontinent wing: Pakistan Navy men ours". Indian Express. 12 September 2014. Archived from the original on 2014-09-12. Retrieved 12 September 2014. ^ Sanchez, Ray (18 September 2014). "Al Qaeda branch in South Asia launches first assault". CNN. Archived from the original on 2014-09-19. Retrieved 20 September 2014. ^ "Al Qaeda condemns Pakistani Taliban's attack on Peshawar school". The Long War Journal. Archived from the original on 2015-04-26. Retrieved 4 May 2015. ^ "Al Qaeda's India wing mentions PM Modi in video". Hindustan Times. Archived from the original on 2015-05-04. Retrieved 2015-05-03. ^ "Al Qaeda Branch Claims Responsibility for Bangladeshi Blogger's Killing". NY Times. 4 May 2015. Archived from the original on 2015-05-05. Retrieved 4 May 2015. ^ "Secular activist hacked to death in Bangladesh". english.alarabiya.net. Archived from the original on 2018-06-28. Retrieved 2019-01-24. ^ Saad Hammadi. "Founder of Bangladesh's first and only LGBT magazine killed". the Guardian. Archived from the original on 2016-05-02. Retrieved 12 May 2016. ^ "Al Qaeda in the Indian Subcontinent claims killing of LGBT activist, friend in Bangladesh". The Long War Journal. Archived from the original on 2016-04-30. Retrieved 12 May 2016. ^ a b Azam, Kawsar (4 September 2014). "Al Qaeda won't gain ground in Bangladesh: Politicians". English24.com. Archived from the original on 2017-01-18. Retrieved 22 January 2017. This page was last edited on 19 March 2019, at 19:31 (UTC).